The English word 'coffee' is derived from the Turkish word 'kahve'. In Turkey the public coffeehouse is also called 'Kahve' or in old way; 'Kahvehane' or very-very old way 'Kiraathane' and it continues to be the meeting place of the traditionalist throughout the Eastern Mediterranean. The real addict ('tiryaki' in Turkish) is the person who drinks coffee without any sugar so as to savor fully it's rich aroma. Turkish coffee is a real symbol of abiding friendship. In spite of the advent of the Martini, coffee still persists as the symbol of friendly exchange in Turkish culture. A SINGLE CUP OF COFFEE IS REMEMBERED FOR 40 YEARS. Turkish Coffee symbolizes many more things of course. For one thing, it is not a drink for minors! Since only adults are served coffee, drinking it is a sign of one's maturity. More signs can be read from the coffee grounds left in the cup, hence Turkish Coffee's key place in fortunetelling. Also this is important to note that; Turkish Coffee is not a breakfast drink or one that goes with meals. That is way the Turkish word for breakfast KAHVALTI, implies that coffee follows the breakfast. Turks usually like to drink coffee right after a good meal... especially when they enjoy the time being together with friends. One also has to remember that, contrary to custom in the U.S. for many beverages, by no way, there is no refills or take out service in anywhere. Yes, there is not a single coffee tree in the country. The climate is unsuited for growing coffee and Turks have always imported it from various countries since the year 1540, when it first appeared in the OTTOMAN LANDS. That is why Turkish Coffee is not a particular bean or blend. What made Turkish Coffee famous around the world is it's ritual of preparation and it's service. Good Turkish Coffee is made of medium to dark roasted coffee beans with no other flavors added. In recent, commercialized versions, sometimes garbanzo or cardamom is also added. Preparation of Turkish Coffee also requires pulverizing the beans to a fine powder in a proper coffee grinder. It is not possible to make good Turkish Coffee with coarsely ground beans! If you want to prepare Turkish coffee and already have properly roasted and ground beans, you will need a CEZVE(jezveh), which is a cylindrical pot of copper or brass with a long handle and which is sold in the US at some Greek and Middle Eastern food stores. It comes in ONE, TWO or FOUR-CUP sizes, but the one-cup size is preferable. Measure room temperature water in the CEZVE and place on medium to low-heat. Btw; never use warm or hot water! Once the water is warmed slightly, stir in the coffee (one heaping teaspoon per demitasse cup), then add the amount of sugar desired and stir well. Let the coffee come almost to a boil on very low heat hence it should be removed from the heat and stir once more. Turn the heat until the coffee begins to foam and starts rising. NEVER STIR THE COFFEE or LET IT BOIL. Remove and serve just as the coffee comes to the point of overflowing from the pot. As you noticed, preparation of Turkish Coffee requires the close personal attention of the preparer because if the coffee is allowed to boil over and lose it's foam, it is nor longer drinkable. The coffee must especially be prepared using medium , medium-low heat as the coffee cooks faster at a higher temperature it will not have enough time to develop the full flavor and aroma of good Turkish Coffee. The best traditional way of serving Turkish Coffee is to fill the cups from the CEZVE in front of the guest. When doing this, CEZVE should be handled properly and in two steps the liquid and its foam must be distributed evenly into two cups. Well-prepared Turkish Coffee always has rich foam on the top. Lack of foam indicates bad preparation and/or bad quality of beans. Some believe that when the foam is absent on the surface, the host loses face. 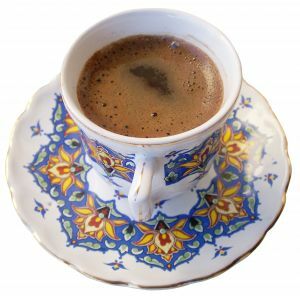 Traditionally, Turkish Coffee is also served with a glass of water on the side. We hope you find this information interesting and helpful. We Turks say 'AFIYET OLSUN' (Good appetite to you) when the guest compliments the host; Literally: 'enjoy it !'. When you visit Turkey, perhaps you might be served Turkish Coffee in a different way than what we explained above. Well... like everything else, the things are changing everyday, everywhere and unfortunately we can't stop it. What we explained is the traditional way of Turkish Coffee preparation. Although Turkish coffee (Kahve) is world famous, but it is not, as one might think, the Turkish national drink. That honor goes to the black tea, what Turks call Çay (pronounced 'chay'). By the way; CAY is not drunk from porcelain cups or mugs, Turks drink CAY with a small tulip shaped clear glass, which called Cay bardagi in Turkish. It is served unsweetened, but is accompanied by one or two sugar cubes and a small spoon on the saucer. Turks are very superstitious, so after drinking their coffee, they love to read the future, what is called 'FAL' in Turkish, through shapes that coffee grounds forms, at the bottom and on the sides of their coffee cup (fincan). If you want to do the same thing, after finishing your coffee, you need to cover the cup with the saucer, swirl the coffee sediment to coat the inside of the cup and then turn your cup upside down and wait while the coffee drains into the saucer. Then, ask an expert to read your future. Many older women know how to read the future (FAL) from the patterns the coffee grounds leave on the walls of the cup.